As our results testify, CUDT is the most successful university dancesport team and is supported by the Cambridge Dancers' Club (CDC), one of the largest non-profit student-run organisations in the country. CUDT travels regularly around the country to various university competitions and also trains dancers who compete in national and international amateur competitions. 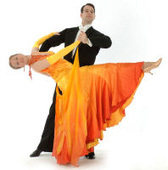 DanceSport is the UK's fastest growing sport and has been brought further into the public eye by primetime television shows such as Strictly Come Dancing. DanceSport is serious business and is an expensive pursuit. Costs of coaching, practice venues, costumes, transport and competition entry fees all quickly add up to stretch student budgets. Sponsorship is required to keep CUDT at the forefront of the competition. By sponsoring CUDT, you will be reaching out to students at Cambridge University through CUDT and CDC's presence at Freshers' Week, May balls and regular dancing demonstrations around Cambridge. Your company's name will be associated with sporting excellence at Cambridge University. Have a look at our new promo video. We will be happy to discuss sponsorship packages. Please contact the CUDT Captain.